Alondra Johnson was born June 22, 1965 in Los Angeles, California and attended West Texas State. His CFL career began in 1989 when signed as a free agent with the BC Lions. That year he was the Lions’ nominee for Most Outstanding Defensive Player. He continued to play with the Lions through the 1990 season. In 1991 he signed with the Calgary Stampeders as a free agent. 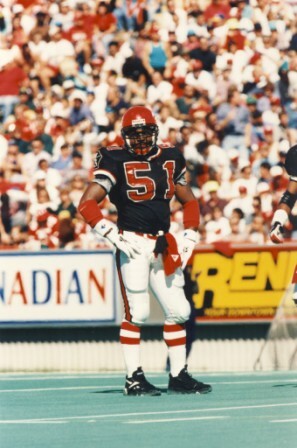 In his first season with the Stampeders, Johnson was named a Western Divison All – Star and led all CFL linebackers in turnovers with eight. By 1995 Johnson had past the career mark of 500 defensive tackles. He had led the team for the fifth year in a row in defensive tackles and was named All-Canadian for the first time in his career. Johnson was named a Western All-Star for the fifth time in 1998. This season also marked his fourth Grey Cup appearance and second Grey Cup victory. He was named the Defensive Player of the Game after setting a new Grey Cup record of seven defensive tackles. In 2002 he surpassed the career mark of 1,000 defensive tackles. At the time of his retirement in 2004 he was second of all-time in defensive tackles with 1,086.